SSC Scientific Assistant Govt Jobs Recruitment: Staff Selection Commission invites applications from young and dynamic personnel for the vacancies of Scientific Assistant Jobs. The SSC Scientific Assistant vacancies are in Meteorological Department. The SSC recruits these vacancies by way of competitive examination for recruitment of Scientific Assistant. 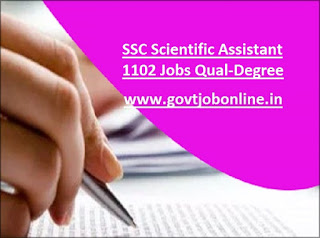 The interested and competent candidates can apply for SSC Scientific Assistant jobs only by online mode. The applications are accepted from 18-07-2017 to 14-08-2017. The competitive exam for SSC Scientific Assistant Posts will be from 20-11-2017 to 27-11-2017. There are total 1102 vacancies in Scientific Staff Selection Commission. The applicant applying for SSC Scientific Assistant Posts should not exceed 30 years of age. The candidate should have the minimum educational qualification for the jobs of SSC Scientific Assistant as per the official notification. The application fee for the SSC recruitment is Rs. 100. There are total 9 centers in which competitive examination for SSC Posts will be held. For more details and further information regarding educational qualification, age limit, pay scale, available vacancies, exam pattern, syllabus, selection procedure and applying process about Staff Selection Commission Scientific Assistant Jobs go through the information given below. There are total 1102 vacancies for the recruitment of Scientific Assistants in Staff Selection Commission. For further details regarding available vacancies refer the official website ssconline.nic.in. The candidate who is interested to apply for SSC Scientific Assistant Vacancies should not cross the age of 30 years as on 04-08-2017. The date of birth shall be considered as in the study certificates only. However, relaxations are provided for reserved candidates. The candidate should have the minimum educational qualification of Bachelor’s Degree in Science/Computer Science/Information Technology/Computer Applications or Diploma in Electronics and Telecommunication Engineering from a recognized Institution/University or equivalent. There are many side and desirable qualifications required for SSC Jobs. The applied and selected candidates will receive a monthly pay of Rs. 9,300-34,800. There may be an increase in the pay band based on the rules of SSC. The candidates must attend and qualify the open competitive examination which will be conducted by the SSC Board. After qualifying the exam, candidates will be called for personal interview. The SSC will conduct an open competitive examination all over India. The examination will be conducted in 9 centers across India. The examination will be conducted by two papers for a total of 200 marks. Examination based on Computer Science, Physics, Information Technology, Electronics & Tele Communications Engineering for 100 marks. For examination syllabus and other details refer the official notification. The interested candidates need to pay an application fee of Rs. 100 to the Board of SSC. There are relaxation of fee for reserved candidates. The candidates have to submit their applications online before 04-08-2017 after paying the application fee. Download the admit card from the official website and appear for the exam. For further information and more details about Staff Selection Commission Scientific Assistant Vacancies refer the official notification.